Spring time in Somesville brings a sense of excitement and anticipation to those who know what is soon to happen in and around the watershed. Local osprey, eagles, gulls, and harbor seals certainly know. Many human residents, visitors, photographers, and students know, too – the alewife river herring migration is about to get underway! 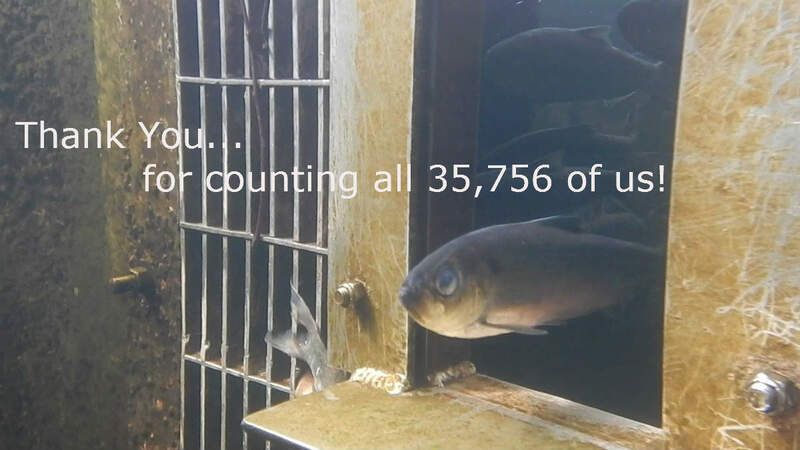 From a low number of 361 alewife returning in 2005 to almost 40,000 last year, we are always wondering – how many alewife will come to spawn next season? No matter what the actual number, the watershed is a place of wildlife spectacle during the run, with all sorts of predators trying to capture and eat some of the 10 to 12 inch fish. Alewife (Alosa pseudoharengus) arrived in Somes Harbor at the beginning of May this year from nearby coastal waters. Similar to the past two years, we had high stream flows from heavy late winter and early spring rains. Despite the high volume of water cascading over the Somesville Mill Pond dam and blasting down the fish ladder, the first alewife ascended on May 12th, the same day last year’s run began. Footage of water flows (and fish ladder maintenance work) in late April and early May can be seen at https://www.facebook.com/somesmeynellwildlifesanctuary/ , and scrolling down to posts from those dates. The first day of the 2018 run, 345 alewife entered when we opened the gate and they ventured into the Mill Pond, on their way to Somes Pond and Long Pond to spawn. By the end of the first week of the migration we had counted 11,272. Last year’s first week yielded only 46 fish, but there was a very large migration pulse on the 9th day of almost 13,000 alewife! Graph 1 represents a comparison of the 2018 and 2017 migration timing and number of alewife arriving at the Mill Pond and at Long Pond (1.5 miles upstream). Volunteers and Sanctuary Staff counted 37,678 alewife entering the Mill Pond and 12,745 (33.8% of total) at Long Pond this year. Last year’s count numbers were 39,813 (MP) and 8,669 (LP, 21.8%). These are actual complete counts at both locations, with a (likely) very small margin of error. At the Mill Pond site, after opening an 8-inch wide doorway in the slotted outflow grate, we watch fish emerge from the top chamber of the fish ladder. The fish sense the stronger water flow through the larger opening, move towards it, and cross a bright aluminum plate as they enter the Mill Pond. We use a simple hand clicker counting device to keep track as we watch the dark-backed fish cross the plate. Oftentimes, the alewife come out one or two at a time, but if there are many hundred or more in the top chamber they come out faster than that, and you can get a sore thumb while clicking away to keep up. At the Long Pond outlet dam and fish ladder, we actually net each fish from a temporary trap and place the fish in the lake. We count each one as it leaves the net. Over the past several years Sanctuary volunteer JF Burns has done most of this transfer work (see photo). Thank you JF! Travel time for the first alewife entering the Mill Pond to arrive at Long Pond was only 2 days! A significant feat, given the blasting water flows and an obstacle filled mile and a half swim. During the inbound migration, we release and count fish 2-3 times per day in an effort to document the status of this watershed’s run. We are required by the State Division of Marine Resources to monitor the recovery of the local alewife population after significant fish passage improvements coordinated by former Sanctuary Director David Lamon 12 years ago. In 2005, a total of only 361 alewife entered the Somesville Mill Pond. Graph 2 shows the yearly total returning alewife counted at the Mill Pond (2005-2018) and Long Pond (2010-2018) – a significantly positive overall trend. The Maine Department of Marine Resources (DMR) supplemented the alewife population in Long Pond from 1985 to 1990, then again in 2008, 2010, 2011, and 2013. The total number stocked in Long Pond was 22,227, according to a report from former DMR Staff Biologist Claire Enterline, while Somes Pond received a total of 1,384 alewife in 2006 and 2007. The sources of the spawning condition fish were the Androscoggin River (Brunswick Fishway), Union River (Ellsworth Dam), and Sebasticook River (Ft. Halifax Dam). The Sanctuary started tracking returning fish at Long Pond in 2010. Alewife were also stocked in Long Pond in the early 1950s. While total numbers have increased significantly, the age structure of the returning fish population suggests some issues with the health of the population. We take several scales from the backs of 100 alewife at both the Mill Pond and Long Pond each year. These samples are spread throughout the time of the run from beginning to end. Scales are sent to DMR for analysis under microscope to detect the number of annual rings present for aging and to see if these rings have been scuffed up. If a scale shows signs of abrasion, it means the fish sampled has made its way upstream before to spawn, scraping across ledge and rocks to make it up – a repeat spawner. Alewife make spawning runs from age 3 to 9. Results from the past few years’ scale sampling show that most returnees are 3 or 4 years old, with some 5 year olds, and very few older fish. Not surprisingly, a wider age range would be representative of a healthier population. Older fish are generally larger fish, and females can carry more eggs as they get bigger. Our repeat spawning rate the past two years has been in the 10-15% range. We are not sure why we don’t have more older fish returning. Possibilities include predation, ocean harvest, and drought induced low stream water levels during outbound migration. We look forward to comparing this run to others along our coast and trying to understand more fully. This fall we’ll get another snapshot of this population from analysis of 2018 scale samples. Overall, the Somes Brook run is much better off now than in the recent past, thanks to fish passage improvements and a great deal of partner and volunteer help. Financial support will be important, too, as some of the fish ladder chambers have already deteriorated and require patching and replacement. Labor and material costs for parts of the project we can’t do ourselves adds up quickly. We need to tackle needed repairs and replacement so we don’t reverse course on alewife recovery and the ability of other species, like eels, to move up and down the watershed. Thanks to our volunteer fish counting crew: Sharon and Enoch Albert, John Correa, Anna Farrell, Elli Hartig, Lindsey Jones, Emma Kimball, Barbara Myers, Sanctuary Board Member Chris Petersen, Xochitl Ortiz Ross, Rusty and Julie Taylor, and James Zordan. Volunteer scale sampling help this year came from Kira Wilson, Xochitl Ortiz Ross, Jake Jacobson, Liz Laverack, and JF Burns. Bruce Connery, Bik Wheeler, Chis Heilakka, Erickson Smith, Chris Long, Lara Katz, Morgan Ingalls, and the rest of the Biological Staff at ANP are always a big help with installing the Long Pond fish trap and work up and down the watershed. Other stream passage maintenance crew include John Correa, Gilly Gilmartin, Michael Marion, Kira and Xochitl, Chis Petersen, David Lamon, James Zordan and a great College of the Atlantic student group. Long Pond. EBS in Town Hill was helpful again this year in offering the purchase at cost of many sandbags, needed for temporary channel refinement. Special thanks to JF Burns who does the vast majority of counting and moving of fish from the trap into Long Pond. Thanks to all! Park Biologist Bruce Connery and College of the Atlantic students work on Earth Day 2018, shoring up fragile fish ladder at second dam in preparation for the alewife migration. Alewife headed up Somes Brook to Somes Pond and Long Pond to spawn. There are four fish ladders and many cascades and high velocity narrow chutes to overcome on the way. These fish are remarkable athletes – impressive strength and endurance! 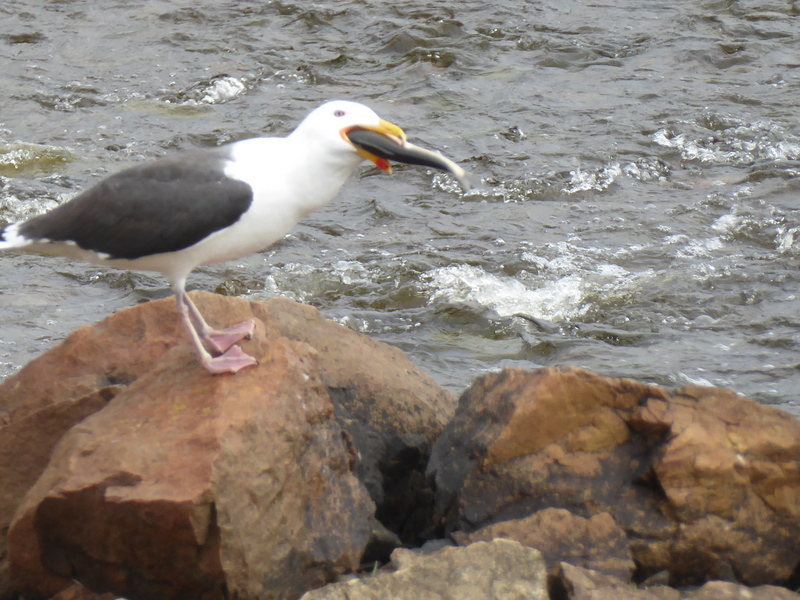 This large, early arriving alewife was spotted, grabbed, and swallowed by the black-backed gull waiting for such an opportunity. Sanctuary Volunteer JF Burns netting alewife from top of the fish ladder trap into Long Pond, counting along the way. Volunteer Citizen Scientists counted 35,756 alewives during this season’s spawning run in Somesville. With the help of our volunteers we were able to accomplish our task of collecting valuable population data that will help inform continuing restoration efforts in Somesville and beyond. 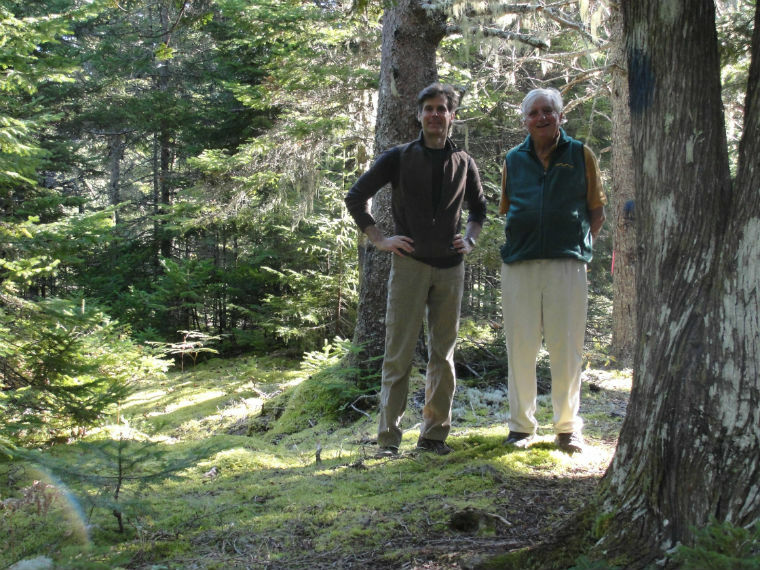 The Somes-Meynell Wildlife Sanctuary recently received a $4,000 grant from the Hancock County Fund of the Maine Community Foundation for support of their “Citizen Science Corps” program. “Citizen Science” is scientific research conducted, in whole or in part, by amateur or nonprofessional scientists. “As a small non-profit with a mission of environmental research, conservation and education the Somes-Meynell Wildlife Sanctuary relies on community volunteers to help carry out many of its programs,” says David Lamon, the Sanctuary’s Director. The “MDI Loon Monitoring Project,” the “Somesville Fish Passage Restoration Project,” and the “Long Pond Courtesy Boat Inspection Program” are a few examples of some of the Sanctuary’s programs that rely on volunteer citizen scientists. “On any given day during the spring and summer seasons you might find MDI High School students collecting data on migrating alewives (a sea-run fish species), retired couples monitoring and observing nesting loons on MDI’s lakes, or a local resident greeting and educating boaters about invasive plant species at the public landing on Long Pond,” said Lamon. “Engaging citizens with local environmental research and monitoring projects benefits our local communities by developing knowledgeable and committed individuals who will become active stewards of their own local environment, it’s a win/win situation,” says Lamon. For more information on the “Citizen Science Corps” program or how to become involved please contact the Somes-Meynell Wildlife Sanctuary at 244-4027, email somesmeynell@gmail.com, or visit www.somesmeynell.org. Join Sanctuary staff and volunteers on Saturday, May 24th from 10am-12pm in celebration of “World Fish Migration Day.” Activities will include alewife counting, scale sampling, tours of the historical fish ladders and more! Meet at the Historical Society parking lot along the Mill Pond. For more information please contact the Sanctuary at 207-244-4027. Moorehead (Mike) Kennedy (on right) tours Sanctuary Director, David Lamon through the land he donated to the Sanctuary.